Leaves by the Bolognese artist, newly donated to the Getty Museum, represent six of the twenty known pages surviving from a Renaissance gradual. In the Divine Comedy, Dante Alighieri praised Bolognese manuscript illuminators as being among the greatest artists of that medium. The most prolific Bolognese illuminator of the fourteenth century was Niccolò di Giacomo di Nascimbene, called Niccolò da Bologna (active 1349–1403). 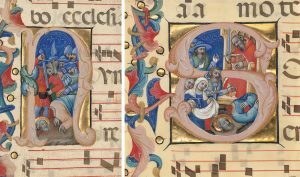 James E. and Elizabeth J. Ferrell recently gave six impressive leaves from a choir book as a gift in Elizabeth’s name to the Manuscripts Department of the Getty Museum. 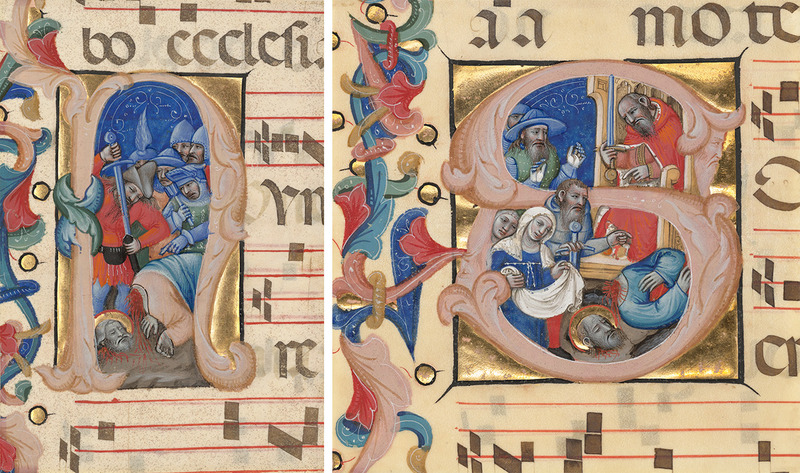 The beautifully preserved pages will go on view later this year in the exhibition Artful Words: Calligraphy in Illuminated Manuscripts (December 18, 2018–April 7, 2019). 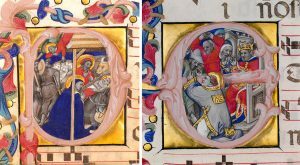 This post highlights the remarkable donation and the importance of Niccolò’s art, in advance of a longer scholarly article about Bolognese choir book illumination, which is in preparation now. Jim and Zibbie, as we in the Manuscripts Department know them, have been actively engaged with the Getty for almost twenty years. Several manuscripts from their important collection were on long-term loan to the Museum in the past, and we have displayed them in numerous exhibitions, including Imagining the Past in France, 1250–1500; Gardens of the Renaissance; Untold Stories: Collecting and Transforming Medieval Manuscripts; and The Shimmer of Gold: Giovanni di Paolo in Renaissance Siena. The Ferrells have also lent works of art to the Getty Villa, most recently to Roman Mosaics across the Empire, and have generously supported the Gettywide exhibition program. The Getty Villa reinstallation will also feature objects loaned from their collection, as will the manuscripts exhibition at the Getty Center Pathways to Paradise: Medieval India & Europe (May 1–August 5, 2018). The donation of six leaves by Niccolò da Bologna adds significantly to the Museum’s holdings by the artist and from the great medieval university town of Bologna more broadly, as we will see. We are grateful for the friendship of the Ferrells, for sharing their treasured works of art with our many audiences, and for their stewardship of the manuscripts in their collection. 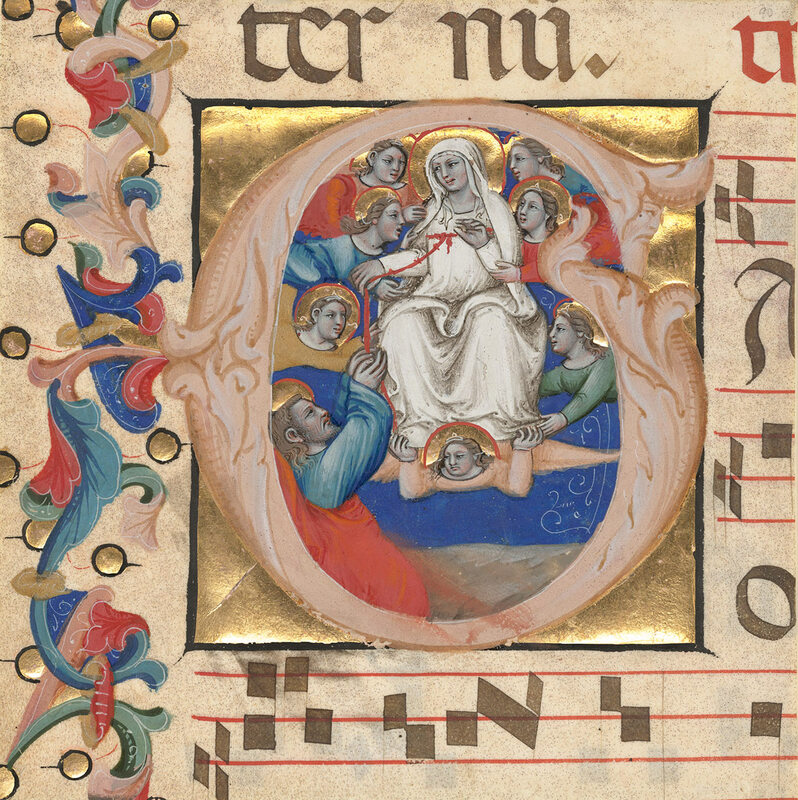 The vast output of decorated books for churches, confraternities, legal institutions, and other patrons in cities within the Bolognese contado (region) and in broader Emilia-Romagna and Tuscany testifies to Niccolò’s fame in this art form. 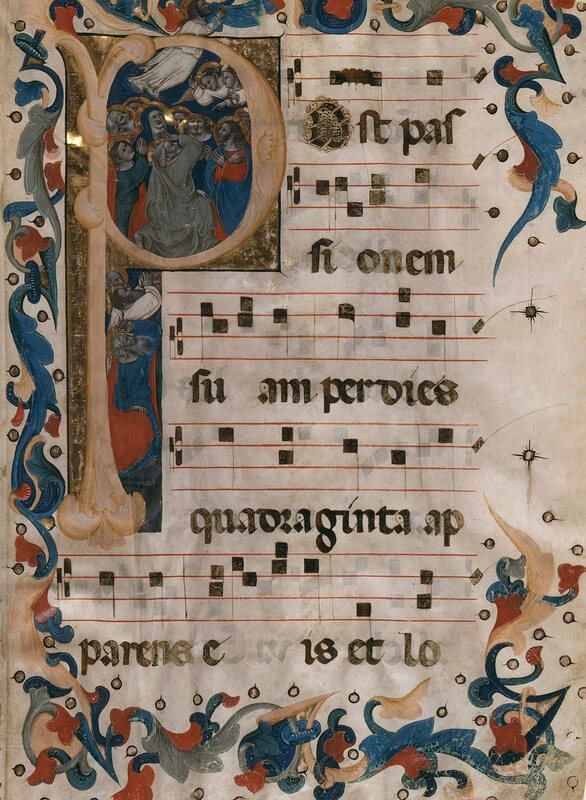 The six large foliate initials containing narrative scenes—referred to as historiated initials—are from a group of twenty known cuttings originally from a choir book made for the Carthusian monastery of Santo Spirito in Farneta (Lucca), commissioned by Niccolò di Lazzara, the archbishop of Lucca. 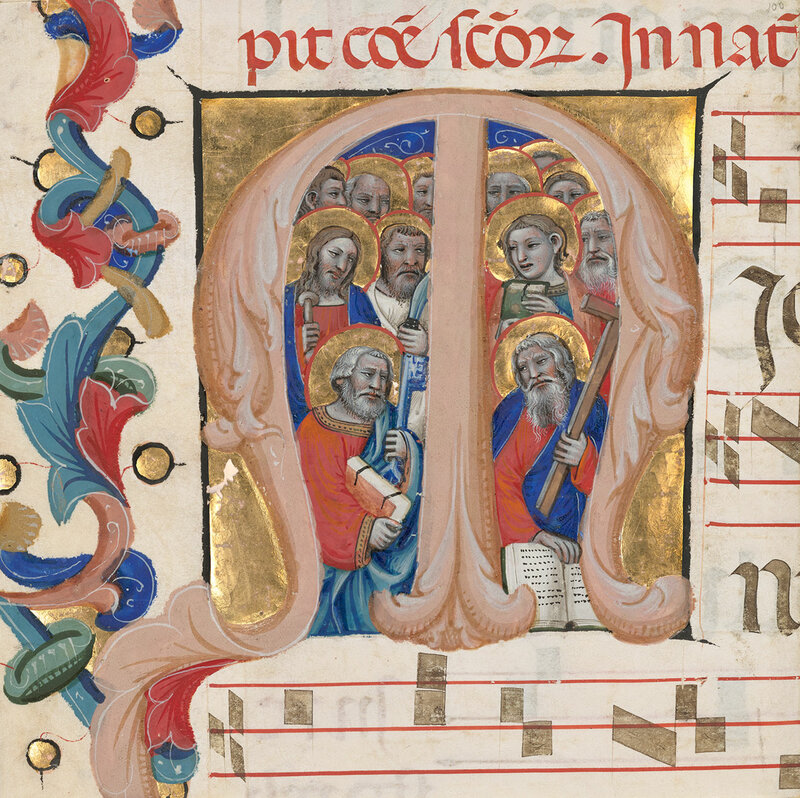 The type of choir book is more specifically known as a gradual, which contained the sung portions of the Mass. Niccolò is known for his expressive figures and crowded, action-filled narrative scenes. 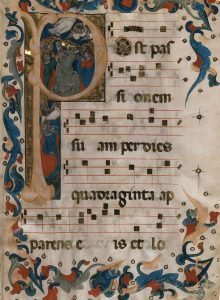 His earliest signed works of the 1340s and 1350s are copies of canon law, but his output in the field of choir book illumination is immense throughout the second half of the fourteenth century—so much so that no comprehensive study exists of his oeuvre of liturgical books. In the 1380s, toward the end of his career, he was named illuminator of the city of Bologna, and he later became an active member of city government. 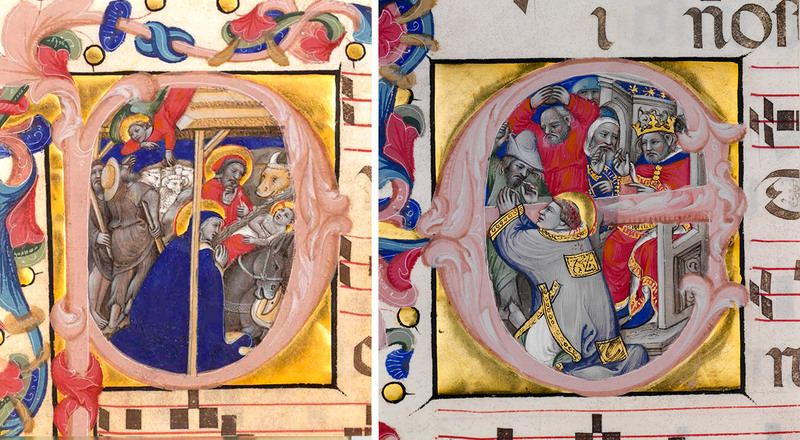 Prior to the donation by the Ferrells, during the 20 years that the Getty Center has been open, the Manuscripts Department was able to add two exceptional examples of Niccolò’s work to the collection: a leaf with a miniature of Saint Dominic from the register of the Shoemakers’ Guild (Ms. 82) and a cutting with Pentecost (Ms. 86) from the same choir book for the Carthusian monastery in Farneta. Each of these pages demonstrates Niccolò’s ability to render figures with a monumentality that seems to allow them to leap off the page. He is an artist whose rich and varied oeuvre is immediately recognizable and always visually appealing. 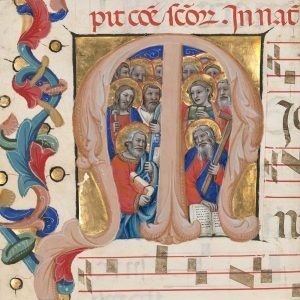 The decoration of choral manuscripts often required illuminators to develop creative strategies for fitting figures and narratives within the curves or linear forms of initial letters that began important chants—the curve of the S (above) seamlessly divides the Virgin Mary and six Apostles from the remaining Apostles in the Pentecost scene. Niccolò treated the same narrative subjects in multiple commissions, but he managed to continually reconceive compositions, expressions, and poses. 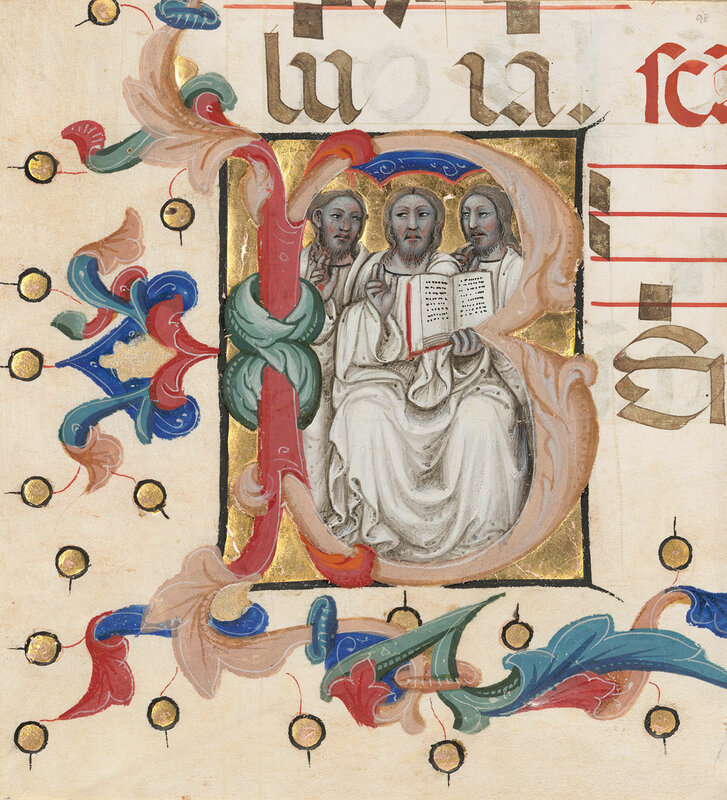 Three bearded men with identical features represent the Christian Trinity—God the Father, the Son, and the Holy Spirit—and the white robes of each create a visual exuberance of sculptural folds. The central figure holds open a book and makes a blessing gesture. Crowded within an initial N (above), a group of five men gather around a soldier who has just beheaded Saint Paul, whose bloody head and neck add a gruesome effect to the scene. 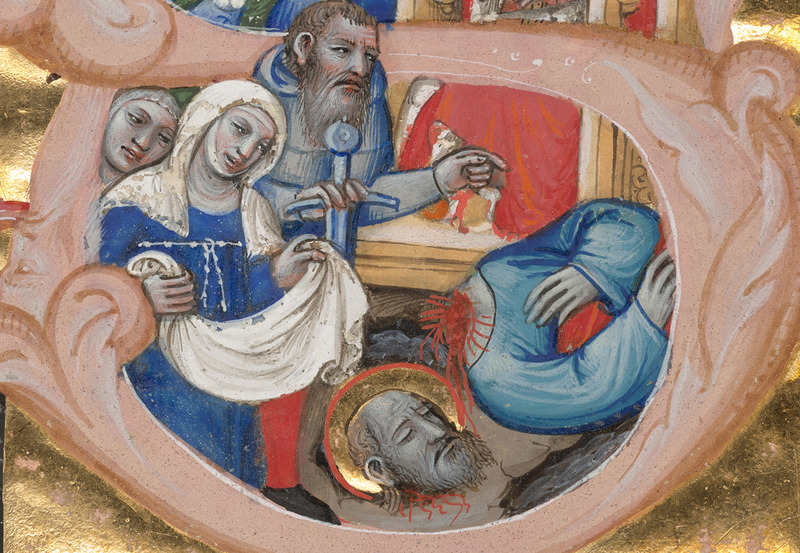 The undulating form of an initial S divides another scene with the beheading of Saint Paul. 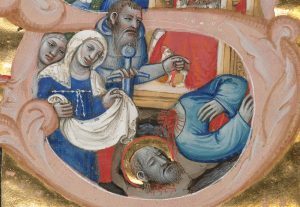 According to the Golden Legend, a woman named Plautilla provided her veil to blindfold Paul, whose severed head bounced three times to create three springs (known as the Aquae Salviae, or the healing waters), which Niccolò has subtly rendered amidst the spurting blood. The saint returned the veil to Plautilla after his death, as his soul ascended into heaven. 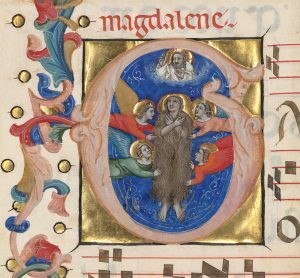 Saint Mary Magdalene and the Virgin Mary, each in an initial G (both shown at the beginning of this post), are bodily assumed into heaven. The Magdalene is covered by her hair, which grew long during her meditation in the wilderness. 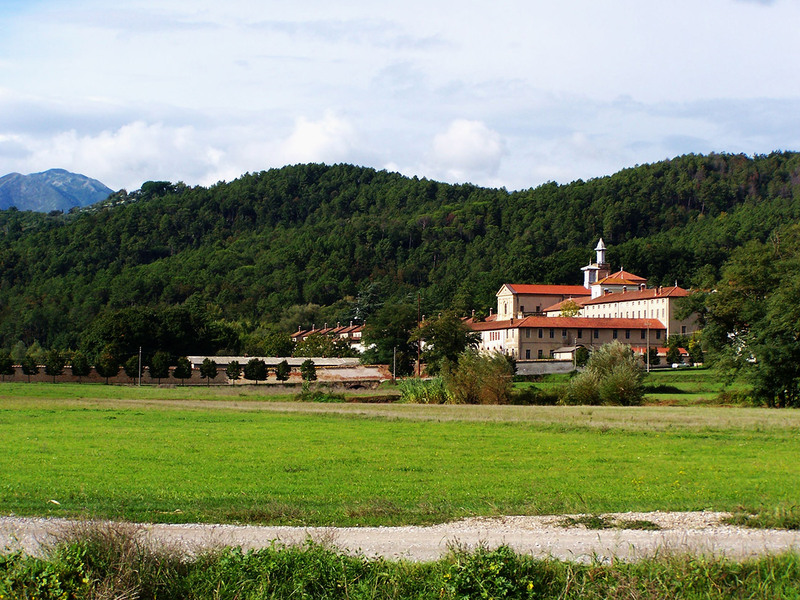 The Holy Virgin gives her girdle (belt) to Saint Thomas, who according to the Golden Legend was in India at the time of Mary’s assumption, so that he would witness and believe that she had returned to Heaven (the girdle was one of the most celebrated relics in Tuscany at the time). The middle leg of the above initial M separates the Apostles into two groups of six, several of whom hold the instruments of their death. 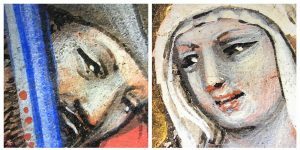 The faces of these men can be compared with their counterparts in the scene of Pentecost shown earlier. Niccolò’s faces are indeed among his most impressive details. Sometimes they are executed rather quickly—perhaps due to his enormous workload—and at other times they are rendered with nuanced perfectionism, as the details below demonstrate. 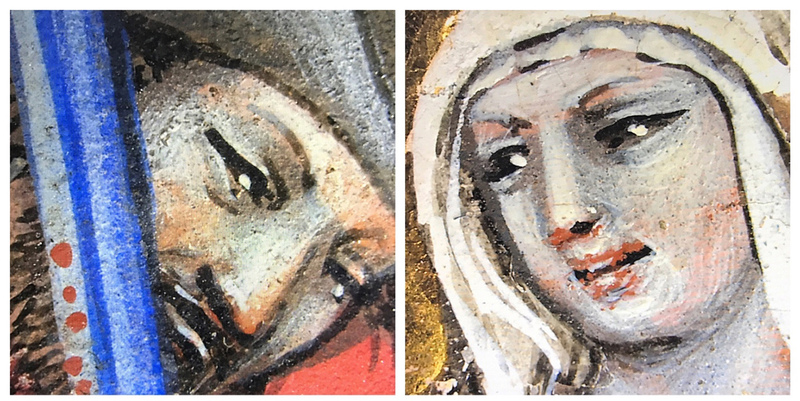 (I thank Paper Conservator Michelle Sullivan for kindly taking these photos under magnification). Bolognese art of the late medieval and early Renaissance represents a strength in the Getty’s collection and in our recent collecting history. 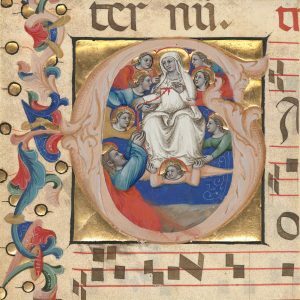 Notable masterpieces include the contemporaneous leaf from Gratian’s New Digest, a manuscript of Roman law, by the artist known as Illustratore (Ms. 13) and a missal illuminated by the Master of the Brussels Initials for Pope Innocent VII (Cosimo de’ Migliorati) (Ms. 34). 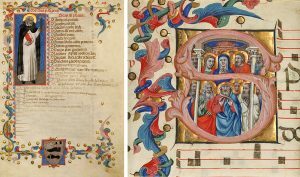 Two exquisitely preserved late-thirteenth-century Biblesm, the Abbey Bible (Ms. 107) and a Bible for Dominican use (Ms. Ludwig I 11), and an antiphonary for Dominican use by the Master of Gerona (Ms. Ludwig VI 6), represent the hallmarks of Bolognese illumination that Dante praised (in the quote at the beginning of this post). 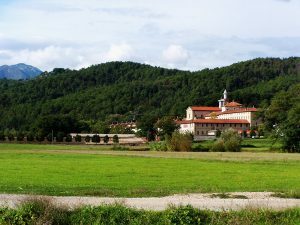 In 1838, the monks of Santo Spirito in Farneta sold the choir books illuminated by Niccolò da Bologna to Scottish bibliophile and antiquarian James Dennistoun (1803–1855). 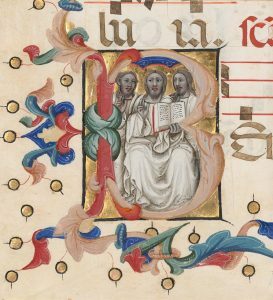 Dennistoun also acquired another choir book from the Carthusian monks in Farneta, with at least eight surviving cuttings by a Lucchese illuminator, perhaps a follower of Martino di Bartolomeo (for a pair of historiated initials from this set, see a recent auction catalogue here). By descent, the set of twenty leaves by Niccolò passed to Dennistoun’s granddaughter, Isabella Dennistoun Henson (1869–1949) of Durham, England. Around 1930, Kenneth Clark, Lord of Saltwood (1903–1983), acquired the set, which he sold at Sotheby’s in London on June 18, 1962 (lot 125). Renowned manuscript collector and dealer H.P. Kraus (1907–1988) owned the group of leaves, which appeared in his catalogue 172 in 1985. From there the set of leaves led eventful lives in various private collections across Europe and the United States. Here is a list of the known leaves as they appeared in Kraus’s catalogue—with some edits to titles to reflect current scholarship—as well as their present whereabouts. We would be grateful if any reader has information about any of these leaves or others yet unknown.